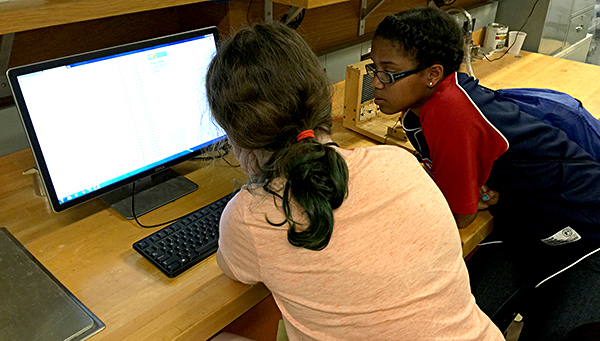 The free Purdue University Cybersecurity Camp will return to Purdue’s West Lafayette campus June 9–14, 2019, for girls entering the ninth through 12th grades. Purdue’s Department of Computer and Information Technology is well positioned to provide graduates ready for work in cybersecurity, a field poised to add 1.5 million jobs by 2020. Courses in cybersecurity titled Certified Ethical Hacking and Certified Information Systems Security Professional will be the first CareerMakers certification opportunities offered by the Purdue Polytechnic Institute at Westgate @ Crane Technology Park. Law enforcement agencies have been relying on forensics tools not well suited to today’s digital world. To provide a modern, cost-effective solution, a research team led by Kathryn Seigfried-Spellar, assistant professor of computer and information technology, is building File Toolkit for Selective Analysis & Reconstruction (File TSAR) for Large Scale Computer Networks. Students working in the Department of Computer and Information Technology have discovered “Ring-Road,” a software bug which could make it easier for hackers to breach popular services like Google’s Gmail. Darien Huss, a 2015 graduate of Purdue Polytechnic’s computer and information technology program, helped stop a worldwide cyberattack Friday (May 12). The ransomware attack, dubbed “WannaCry” by security researchers, affected hundreds of thousands of Microsoft Windows-based computers in 150 countries by exploiting a flaw in the operating system. Spam has advanced from being a recurring annoyance to a significant geopolitical concern, according to Marcus Rogers, professor and head of the Department of Computer and Information Technology and director of the Cyber Forensics Lab. Purdue Polytechnic Institute professors hope to discover an untapped potential in high school students through the first Purdue University Cybersecurity Camp June 12-17. Computer viruses and malware are obsolete scams for the latest wave of increasingly aggressive computer criminals, says a top cyber forensics expert at Purdue University. Marcus Rogers, director of Purdue's Cyber Forensics Lab, said past reports of cyber attacks - allegedly by foreign nations - have opened the floodgates for computer criminals to launch their own illegal efforts.